A bad end to the month, as the American Museum of Natural History becomes the latest museum to lay off staff in response to the ongoing fiscal crunch. Wide ranging staff cuts over the last few days have hit almost every section of the Museum, including science departments that have traditionally been shielded from job losses. Still no word on the final numbers, but it includes a number of my former colleagues and at least one good friend. Beth Merritt, Director of AAM’s Center for the Future of Museums, has been looking for people to do video interviews about their ideas for the future of museums. I was bold enough to volunteer (but not so bold as to give you the link to where the video is posted, although it's not hard to find). Anyway, Beth sent me a list of questions for the interview and being lazy I thought I’d also use them as the basis of a PoH post. 1. What will be the next generation’s experience of museums? How is this different from your experience as a child? The museums that I visited as a child growing up in Britain in the 1970s were object-rich in a way that few modern displays seem to be. But they were also very static – there were very few interactives, and certainly no video screens. Also, the delivery of information was essentially one-way – the museum knew the truth and had chosen to communicate it to the visitor. By-and-large we still do this – we might ask more questions of visitors, but we rarely feed their answers back into the display or communicate them to other visitors. In a world of Wikis, blogs, social networking, and other user-generated content we’ll no longer be able to do that. The other major difference when I was growing up was that to experience a museum, you had to actually go and visit it. Now, of course, there are ways in which you can experience museums and their collections without ever leaving your armchair. It’s sometimes hard to remember what a world without the Web felt like, but it’s not that long ago (which is one reason why making predictions about the future is such a risky business and is best left to a museum ninja like Beth). 2. What are the most important trends in society that will shape museums in the next 25 years? Obviously changing demographics are bound to have an effect. At the moment, we tend to have an attitude in museums that there is an excluded portion of society that we have a responsibility to reach out to. It’s a well-meaning, but rather paternalistic stance and I’m not sure how it will hold up when some of the categories of people that we define as “excluded” form a majority of the population. We also have a tendency, subconscious or otherwise, to regard museum visitation as one of the hallmarks of a well-educated, well-rounded member of society. I don’t know how well that assumption holds up if most people rarely if ever visit museums. 3. Are there kinds of museums that will be extinct in 2033? Will new kinds arise? I actually don’t think any kinds of museum will become “extinct,” as there seems to be a growing, and possibly endless variety of “niche interests” that museums can address. Even museums that would have been regarded as hopelessly outdated a decade or so back can now be marketed as a sort of retro museum experience. The question is more likely to be how many individual museums will become extinct, as the “heritage” market gets more crowded. 4. What is the role of the virtual versus the real in museums in the future? Will that change the way that museums collect? The line between the virtual and the real is getting increasingly blurred. There are many kinds of collection, like the American Museum of Natural History’s Astrophysics collection, that exist only as data – an example of this sort of virtual object would be the dataset generated from running a large scale computer simulation of, say, two galaxies colliding. You run your simulation, archive the data, catalog it, and store it. It’s a specimen, but it’s not necessarily an object. Then there’s the issue of reproduction. In my own field of paleontology, we already have laser scanners that can capture 3-D information about fossils. That data can be fed to a 3-D “printer” – a milling machine – and used to generate an exact replica of the fossil at any scale you want. The ability to capture surface detail is getting better with each successive generation of scanner and eventually they’ll be able to capture color and texture as well. Now, suppose you go 25 years into the future and this technology has become so cheap that anyone can use it, even at home. You could go to a museum website (or whatever takes the place of websites in the 2030s), download a package of data, and run off a perfect replica of a specimen. Now you have a virtual museum experience that you can actually hold in your hand. This may sound farfetched, but you can already purchase 3-D scan data for some specimens - take a look here. Will we still collect? Yes, because otherwise how do we find new stuff that advances science. But if we can reproduce specimens with almost perfect accuracy, will we still value the real thing? And will we still invest in looking after it? 5. Is the role of museums with respect to authority changing? What is the future role of the audience in contributing to the generation of content? Well, Wikipedia wasn’t the end of civilization as we know it. There’s huge potential in letting people have some measure of ownership and participation in the museums that are, after all, part of their shared property. The skill comes in setting the rules – how and where and when you can contribute. You need to have some measure of control without becoming oppressive. And that’s what museums should be thinking about now. There’s a great post by Nina Simon on Museum 2.0 that discusses this. 6. What is the future of the economics of running and supporting a museum? I think it’s important not to get too fixated on the current state of the economy – we are, after all, trying to look into the more distant future. If we go back to my earlier point about the nature of real vs. virtual objects, and about the extent to which technology may be able to duplicate the experience of visiting a museum in your own home (perhaps even including physical contact with objects), I guess one question is will we be able to justify spending money on public galleries, with their high staffing and operating costs. Could you have a museum that was just collections storage, where all of the public access was done remotely? And we in collections shouldn’t feel at all smug about this prospect, because if we can capture, store, and retrieve objects digitally, will we want to spend money on dealing with the real thing? The one thing that we’ve all experienced over the past few years is that collections grow but collections staffing does not. 7. What do museums have to do in the future to maintain the public trust? OK, now I am going to talk about current events. If you give something of great value to a museum, because you want to share it with a wider audience for example, you need to have a reasonable expectation that the museum will look after that item in a responsible manner, and that it will go to the wall before selling it on the open market. And as we’ve seen, for some institutions, that isn’t the case. Anyway, those are just my opinions. If you feel strongly about the future of museums, speak up. Beth is looking for more interviewees and you can find out more about CFM and its mission here. More bad news on the museum front from Brandeis University, which has announced that it is closing its Rose Art Museum and selling its 8,000 piece collection (which includes works by Andy Warhol, Roy Lichtenstein, and Jasper Johns) as part of its response to a projected $10 million budget shortfall. Proceeds of the sale will be invested back into the University. When the idea of sending the early hominid fossil known as "Lucy" on a multi-year tour of American institutions was first proposed, a lot of people expressed concern that a priceless specimen was being exposed to unnecessary risk. I don't think anyone could have predicted that the main risk would be to the financial health of the venues. AP reports that the Pacific Science Center is looking at a half-million dollar loss after the exhibit attracted less than a quarter of the projected 250,000 visitors. PSC president Bryce Seidl announced on Friday that the losses will result in an 8% staff layoff, furloughs, and a wage freeze. Click on the images to see bigger images or, if you want to see more and have some informative captions, go take a look at this gallery over on Facebook. 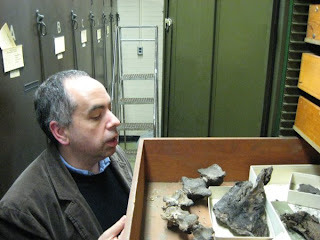 Some years ago, the mammal collections at AMNH were in the care of a man called Helmut. Helmut was a tall German of impeccable dress and manners. When Helmut started work there were no such things as collection managers, so he was classified as a museum technician, but he was collection manager in all but name. In the 1970s and 1980s, Helmut did much of the groundwork that took the AMNH Mammalogy collections from the Dark Ages to, if not the 21st Century, then at least the beginning of the 20th. Helmut was a master of the arcane process by which collection managers make collections fit into spaces much smaller than they previously occupied. This is a major activity in almost all museums. Collections seem, to the untutored mind, to take up a quite unreasonable amount of space. At the Peabody Museum, the Vertebrate Paleontology collections currently occupy over 12,000 square feet. That’s about 8 times the area of my house. Now admittedly my house is not a big one, but that is still a fair amount of real estate. And the Peabody’s collections are small potatoes compared to some – at AMNH, the paleontology collections take up a whopping 60,000 square feet. Furthermore, because of the way in which museums have grown, collections form little (GULAG) archipelagoes of space across a museum’s floorplan, dividing and butting up against galleries, offices, and other non-collections areas and generally getting in the way every time you need to build something. So if you are a museum administrator and you need an extra couple of hundred of square feet of office space for a new hire (especially one who’s going to do something useful, like raise money) then it probably seems like no big deal to ask a science department to eat a 0.33% reduction in floor space, right? Little nibbles of space like this get taken out of collections all the time. And every now and then, somebody will take a great big bite – say 1,000 square feet for a new molecular biology lab. When this happens, a complex little dance of planning and negotiation takes place between curators, administrators, and collection managers, at the end of which your collection usually gets some “new” space – which will, I guarantee, be less than the original space and often in a less desirable neighborhood of the museum. If you’re lucky there will be some new storage cabinets or shelving, or perhaps a rail-mounted compact storage system that lets you absorb some of the space losses. But you have to trade this against the fact that healthy, well-managed collections tend to grow. New specimens are collected in the field and brought back to the museum for study – this is how science (or at least the museum portion of science) progresses. So our 12,000 square feet of paleontology storage at Peabody might be 18,000 square feet in 10 years’ time. Helmutization is an extreme example, but all collection managers have had to do this to a lesser extent at some point in their career – reduce the space occupied by their collection at a cost to its accessibility. There’s also a significant risk of damage – it becomes harder to protect the specimens if they are in close proximity to each other and good collection housing takes space; take a look here for an example of this. So collections grow and at the same time the staffing of museums expands (and sometimes contracts, as we are discovering lately) and we find ourselves in a space crunch. Many museums occupy city center sites where the costs of putting up a new building are high and room for growth is lacking. The usual solution to this is to develop a new facility somewhere else entirely, perhaps on the outskirts of town. Then you can have space aplenty, but at a different sort of cost. If you put exhibits offsite, will the public still come? What about school-groups, particularly those from disadvantaged inner-city school districts? If university research collections move off-site, how do you maintain the synergy of having faculty, staff, and students from different disciplines working in close proximity to the collections? If you move staff offsite, will they feel isolated from the rest of the museum? There is a great temptation to use offsite storage as a dumping ground for things that are felt to be unworthy of precious storage space on the main museum site – the problem with this is that it avoids making hard decisions about what should or shouldn’t be retained, while ensuring that no-one wants to invest much time or resources in developing the offsite facility. It’s the end of my first week at the Peabody Museum, which has mostly been spent writing down numbers. AMNH is a moderately large organization, which meant that there was a lot to learn about the nuts and bolts of doing business there, but Peabody is part of a really large organization, which provides a whole extra level of complexity. Granted, there are advantages to a system that lets you use any photocopier in Yale and have it bill to your departmental account, but it seems to require a degree in astrophysics to actually operate it. I have to type a six digit PIN into my phone to make a long distance call and 11 digits to access my voicemail. And I’m still trying to get my head around 22 digit budget codes. Of which I already have five, with more to come. Hopefully there’s actually some money attached to them. My trusty orange notebook is beginning to look like a cryptographer’s handbook. Then there are the procedures. All museum departments have them; they determine how visitors are granted access to the collections, how specimens are loaned, and how things are documented. Mostly the general principles are the same regardless of the collection, but the (as ever) the devil is in the details. By the end of the week I was more than ready to start getting to grips with the collection itself. You can, in principle, teach the basics of managing a museum collection in a classroom, and there are plenty of museum studies courses that try, but ultimately your success or failure as a collection manager depends on how well you know the material in your care. Not all of it - I know plenty of fantastically knowledgeable individuals who are derailed by a semi-autistic inability to relate to other people (for some reason, they invariably seem to end up working in museums). But it is true that knowledge of the collection is the bedrock on which you build the rest of your job. After 10 years working in one institution, it can be extremely disorientating to walk into an entirel y new collection. One way to tackle this is to break the process of learning into a series of steps. First, you look at the collection rooms. How big are they? Where are the doors? Do they lock? Are they fire rated? Is there air handling? Does it work – is the room too hot or too cold for the material in it? Is there fire suppression? Where are the fire extinguishers? What pipes cross the space? Do they pass over the collection (raising the possibility of water raining down on your specimens when they leak, as they invariably do)? From these first observations you can move on to the collection itself. How is it stored? Is it secure? Is it overcrowded? Is there space for expansion? And finally, you get down to looking at the specimens themselves. Are they cataloged? Is there a lot of unprocessed material? Is there a lot of damaged material? Does it seem like specimens are absent without an obvious reason (e.g. a slip saying that they’ve been removed for study)? There are around 74,000 specimens or specimen lots (groups of specimens cataloged together under the same number) in the YPM VP collections (you can explore them yourself by following this link) so clearly you can’t look at all of them in detail – which is where those collection assessment techniques I discussed a couple of posts back will come in handy. Follow this sort of stepwise process and you will at least have an overview of the physical reality of your collection. However, it’s painfully obvious that you’re only scratching the surface. Beyond the specimens themselves there is an ocean of associated information – about specimen provenance and history, collectors and curators, research, exhibition, and fossil preparation. Some of this is accessible via databases, but most exists only as paper records – a forest (yeah, I know – too many natural world metaphors) of letters, labels, ledger books, card catalogs, invoices, scientific publications… It’s hard work, and I’m easily distracted. Open up a cabinet and you might find a host of massive brontothere skulls grinning back at you. The skeleton of a 20 million year old alligator, so perfectly preserved that it looks like it was bought from a biological supply house. The twisted body of a tapir-like herbivore, still encased in the mud that trapped and drowned it 10 million years ago. Or maybe a thousand tiny teeth, each mounted on a pin head, which are the last remains of a shrew-like mammal that scurried around beneath the feet of dinosaurs. The sort of stuff that made you become a paleontologist in the first place. The Winter 2008 edition of Museum Practice contains a thought-provoking article by David Martin on balancing sustainable practices in museums with the exacting environmental standards that we set for the specimens in our care. Sustainability is a buzz word for many institutions these days and museums are no exception – aside from ethical considerations there are significant financial incentives for the adoption of sustainable practices, from food packaging and waste disposal all the way through to the design and construction of new buildings. In this climate, it’s unrealistic to expect that sustainability should not extend to the ways in which we manage our collections. The concern is that the environmental standards that we are setting are so stringent, and our buildings so incapable of meeting them, that the only way they can be met is by expensive, energy-intensive engineering solutions. So, why not go for broader, risk-based strategies that emphasize passive methods of environmental control, integrated pest management, risk management, and better building maintenance? This is the approach that is being promoted by a number of organizations, notably the Institute of Conservation's Care of Collections Group. This is all well and good and many collection managers, faced with a lack of funds for capital upgrades to their storage facilities, have learned the benefit of using passive, microclimate techniques to reduce the effects of environmental fluctuations on specimens. But as I read the article I began to feel distinctly uneasy. Natural history museums have lagged far behind their fine arts equivalents in the implementation of environmental standards and it’s taken a lot of time and effort on the part of our profession to educate curators and administration that natural science specimens can be subject to as much damage and loss of value as a result of poor controls as paintings or textiles. By relaxing standards, are we sending a message that environmental controls are less important than we originally argued? It could be that we are providing future administrators with an opportunity to “value engineer” the specifications of new storage buildings, using sustainability as cover for a lack of investment. It’s also worrying to see better building maintenance highlighted as a crucial piece of the sustainability jigsaw when the experience of many museum professionals is that it’s far easier to raise money to build a new buildings than to maintain existing ones. But the part of Martin’s article that I found most worrying was the argument that strict environmental parameters specified by lenders are acting as a barrier to institutional loans. Museum Practice is published by the UK Museums Association and in the UK exhibit loans are still primarily seen as an outreach and collections-access mechanism. But for many US institutions (including the one that I used to work for) travelling exhibits are a significant revenue stream. Museum business offices have a mandate to sell these exhibits to as many institutions as possible and this is taking our specimens to some surprising places. I’m all in favor of finding novel venues which allow objects to be experienced by a wider audience and in different ways than can be done in a conventional museum setting. However, the dollar argument is a powerful one, and one of the few things that can overrule it is the counter argument that specimens in our care are being put at risk by the choice of venue. There are ways to safely and sustainably exhibit specimens – by using well-sealed cases buffered with silica gel, for example – but these are often more costly. Which brings me back to my earlier point; we need to be very careful about doing anything that sends a message that environmental controls are not important. Sustainability is a good thing, but if it is to be done properly it will still cost money. Promoting it as a cost-saving measure is not a good long-term approach for collections care. Proving my point that you can never really escape, I spent a pleasant day yesterday working at AMNH – yes, that’s the same AMNH that I resigned from last Friday. Unlike many professions, the projects that you begin in a museum have a lifetime that may outlast your employment there. So yesterday I was working with my long-time collaborator, Lisa Elkin (above left), and our intern Alex Fernandes on a collection assessment project. To understand why we do collection assessments, we need to take a short history lesson. Back in the late 1980s, a Smithsonian entomologist called Ron McGinley wrote a provocative little paper in an entomological journal that basically said that collection managers are nothing of the sort – they don’t actually “manage” their collections in any way that would be recognizable to managers from other professions. Instead, they respond in an unplanned and ad hoc way to challenges thrown at them. McGinley proposed a method of quantifying curatorial effort by assessing collections against a series of criteria that would show how far a particular collection had advanced from the raw, unprocessed state in which specimens arrive in a museum to the point where they are properly housed, identified, cataloged, and available for use by researchers and others. McGinley’s work was groundbreaking, but it represents only one method of quantifying the state of a collection. There are other methods (the SYNTHESYS project, funded by the European Union, has produced a fairly comprehensive summary of these) which look at, for example, the material wellbeing of specimens in the collection, or their vulnerability to certain types of risk. Old-school collection managers are often skeptical of the benefits of spending time on collection assessments, partly because they believe they already “know” what’s wrong with their collection and also (I suspect) because they associate this sort of “management” activity with the real world, which they have successfully escaped by working in a museum. Nonetheless, collection assessments are important precisely because of their real world aspects – for the average university or museum administrator they are a far more persuasive argument for investing scarce funds than any amount of impassioned pleading. And at a time when museums are feeling the impact of the current financial meltdown on their endowment income (Chicago’s Field Museum recently announced a $95 million drop in the value of its investments) it’s becoming even more vital that collection managers can quickly show exactly where those scarce dollars could be best spent. Off course, this assumes that there actually are some dollars to be spent and that there some staff left to care for the collection. Less money means less staff, stretched more thinly, and with less time to do things like collection assessments. Ideally, what’s needed is an efficient survey/assessment methodology that gives you the most information for the least investment of staff time. Which brings us back neatly to the work that I’m doing with Lisa and Alex, as part of a collection improvement project funded by the National Science Foundation. We are assessing the same group of specimens, in this case the AMNH’s world-renowned collection of over 50,000 fossil horses, using different methodologies. The sorts of questions we are addressing are whether you get the same answer if you randomly pick individual specimens from the collection versus all the specimens in a drawer, or all the specimens in a cabinet. We’re also looking at whether methods based on curation progress, specimen conservation, or vulnerability (i.e. risk) will highlight the same groups of specimens as requiring care or produce differing results. The project is already generating a bunch of interesting results, which we hope to publish next year, and feeds directly into AMNH’s plans for the future curation of the fossil horses. Lisa and I bring contrasting approaches to the work as, respectively, a conservator and a collections manager, while Alex brings high levels of energy and enthusiasm, which come through clearly in her entries on the project blog created by our interns. All in all, not a bad way to spend a day off. This Blog starts with an ending; in this case, my leaving the American Museum of Natural History after the better part of ten years. For the last six of these, I was looking after the Museum's collection of 4.75 million fossils. One of the frustrations of managing a collection of this size is that you spend very little actually dealing with the collection - most of your time is spent writing reports, writing grant applications, writing more reports, dealing with staff, writing even more reports..... oh, did I mention that there was a lot of report writing? The last Annual Collections Report for Paleontology, which we are required to deliver to the Museum's trustees each year, was 50 pages and 15,604 words long. That's about the length of the average disseration for a Masters degree. In an idle moment, I calculated that it contained 2,962 individual pieces of data, provided in answer to 193 questions. Which change every year. By contrast, the annual collections report for my new institution, the Peabody Museum of Natural History at Yale, is a standardized form, 2 pages long, with 75 questions. What will I do with all that extra time? Sleep, probably - the other big advantage of moving to Yale is that I actually live just outside New Haven, cutting my daily commute from 2 1/2 hours each way to about 20 minutes. Unfortunately, like a beaten dog, I'm worried that my behavior patterns have become entrenched and I will be leaping out of bed at 5:00am for at least the next six months. 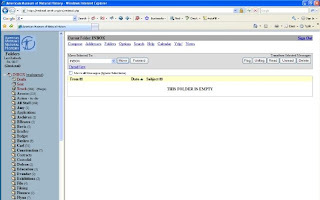 I leave you with a picture of my email in-box on Friday, my last day at AMNH. At one point it had over 17,000 messages in it. To see it empty is a pretty sweet feeling.